Zèrtz is a capturing game, where the pieces in play are not owned by either player. Win by collecting 4 white, 5 gray , or 6 black balls, or 3 of each. Each move consists of either capturing, or playing a new ball onto the board and removing a piece from the edge of the board. There are a few more nuances in the official rules, but that's the idea. 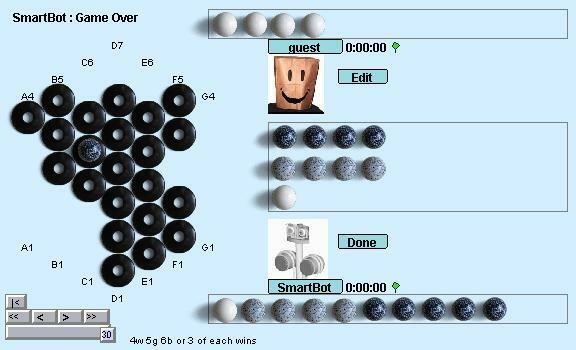 Basic strategy consist of sacrificing black balls in order to set up the capture of white ones. Beginners typically find themselves completely outclassed, but most learn quickly. Properly played, every move in Zertz is a puzzle to be solved. Robots: The robot players for zertz are good sparring partners. They'll beat beginners easily, but even slightly advanced players can crush them. The back story: Zertz is the reason there's a Boardspace. I was spending hours at a time planning moves for PBEM zertz using ZF1. The only way to break out of the insane planning time was to go realtime. I already had all the pieces, I just needed the motivation to finally do it.